Many schools have used the same manual process for course planning for more than 30 years. When the state of Texas issued new course requirements for its students in 2006, known as the “4x4” graduation requirements, one district decided to try something new. The Texas “4x4” graduation requirements necessitate that every student earn at least one credit in each of the four core subjects (Language Arts, Math, Science and Social Studies) during each of their four years in high school. As a result, schools will need to establish a plan of action and implement a comprehensive system to track student participation in courses, particularly Career and Technical Education (CTE) courses. By doing so successfully, districts will have the opportunity to qualify for additional state funding. Clear Creek Independent School District, the 29th largest school district in Texas, with more than 39,000 students across 43 schools, was determined to meet the new requirements while upholding their reputation in the state. In 2010, Clear Creek ISD received the Texas Education Agency’s (TEA) highest ranking of “exemplary,”, a ranking that only 29% of Texas school districts received. The following year, approximately 95% of the students in the district passed The Texas Assessment of Knowledge and Skills (TAKS), and 97.1% of the district’s high school students graduated. Clear Creek ISD attributes its accomplishments to the hard work and diligence of educators. However, despite their progress and achievements, meeting new state standards was increasingly difficult due to the manual processes in place at the district. Suzie Thomas, Director of Student Personnel Services, has seen many variations of these manual processes since she began working at Clear Creek ISD. For years, counselors relied on paper course plans to help students track their courses - paper course plans were especially challenging since they were not easily updated and not readily accessible to students and families. In addition, elective courses did not effectively translate to paper forms: “The counselors were all rather quite comfortable to say ‘here are all your English, Math, Science, and Social Studies, your Foreign Language requirements,’ but then at the bottom, you have ‘elective, elective, elective,’ and they didn’t spell out what those electives were.” said Mrs. Thomas. Clear Creek ISD also tracked and reported CTE courses and coding by hand, which was labor intensive, inefficient, and time consuming. For example, each school in the district would survey its students to see what CTE courses were being taken and what courses students planned on taking. The schools would compare the results to the actual CTE sequence each student had started or was enrolled in. After matching each student’s CTE result and sequence, school staff would then determine the appropriate code and manually key in all the data for reporting purposes. Clear Creek ISD did not want to simply improve their manual processes and streamline operations. They wanted to improve in ways that would directly impact their students. Their plan of action had one objective: to help students plan for success beyond high school and provide course planning resources that are accessible to students and their families. The district determined that it could meet each of those goals with Naviance Course Planner to move from paper to electronic course plans. Clear Creek ISD had set an ambitious goal of having 100% of 13,000 high school students complete an electronic course plan. Initial reports pulled by Mrs. Thomas indicated that many schools were well below the expectation. 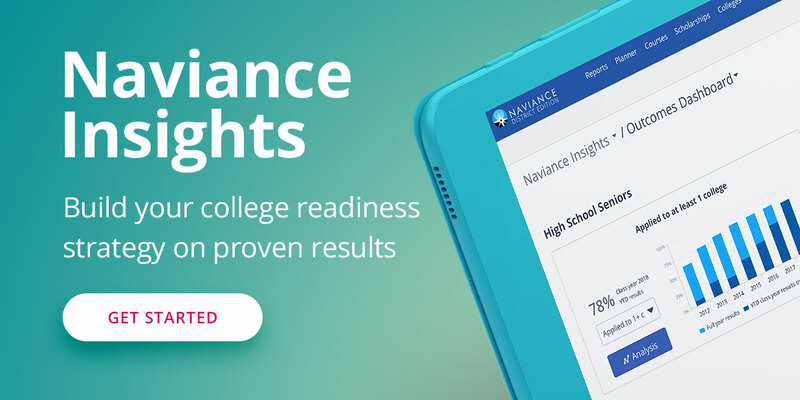 She decided to provide transparency into the progress of each school through completion reports generated from Naviance and scheduled meetings with each school’s principal to address district-wide completion rates. She found that competition and accountability were enough to incentivize school’s to take ownership of the 100% mark. The district has continued to achieve success with course plan completion as each year goes by. Mrs. Thomas has also made it easier for students to use Naviance Course Planner and understand what courses are right for them.